Liverpool city centre lacks facilities to serve the many high rise apartment blocks and student accommodation buildings being constructed. The garden-less developments also lack facilities for pets. The cat emporium addresses this void with a feline cafe and cat playground. A veterinary surgery and cat rescue centre will serve the wider community and provide a home for neglected animals. The building will feature two layers of circulation which weave through the building, one for humans and one alongside for cats to roam as they see fit. The studded facade is equally scaled to both humans and cats, with window seats for both. Most importantly the building will inject some fun back into Lime Street in a proposal that is unique to Liverpool. 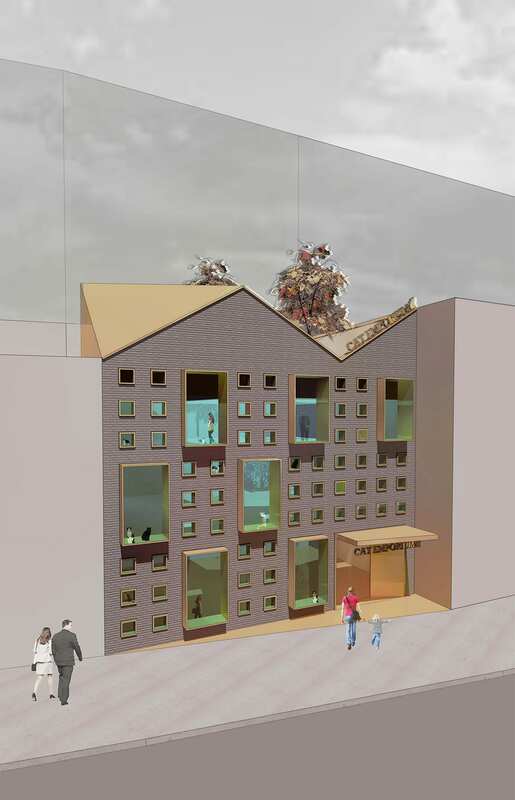 This tongue in cheek sketch proposal was produced in two days and is designed as part of a wider scheme to show that Lime St could be developed in a more individual fashion with different architects working on smaller plots to create a diverse street scene, which responds to users at street level.